Registration is on!!!! 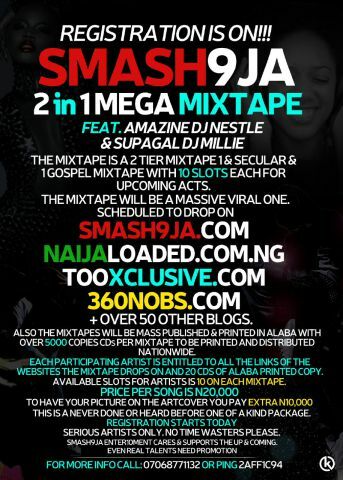 Smash9ja 2 in 1 Mega Mixtape Drops this August . Ft Amazine Dj Nestlé & @SupagalDjMillie. The Mixtape is a 2 tier mixtape 1 Secular & 1 Gospel Mixtape with 10 Slots Each for Upcoming Acts. The Mixtape will be A Massive Viral one. Scheduled to Drop on Smash9ja.com Naijaloaded.com.ng Tooxclusive.com 360nobs.com + Over 50 Other Blogs, Also the mixtapes will be Mass Published & Printed in Alaba with Over 5000 Copies Cds per Mixtape to be printed and Distributed NationWide. Available Slots For Artists is 10 on Each Mixtape. To ave ur Picture on the Artcover U pay Extra 10k. This is A never Done or Heard Before 1 of a Kind Package. Registration Starts Today. NB: If you think the 20k is too much. Think Again. Becus 20k can not upload dat ur hit Track on Smash9ja.com Naijaloaded.com.ng Tooxclusive.com 360nobs.com Over 50 Other Blogs & Also print & Distribute Over 5000 Copies of the Mixtape in Alaba. Smash9ja Enter10Ment Cares & Supports the Up & Coming. Serious Artists, Managements, & Labels Ping Me. This entry was posted in DJ mixs and tagged Registration is on!!! 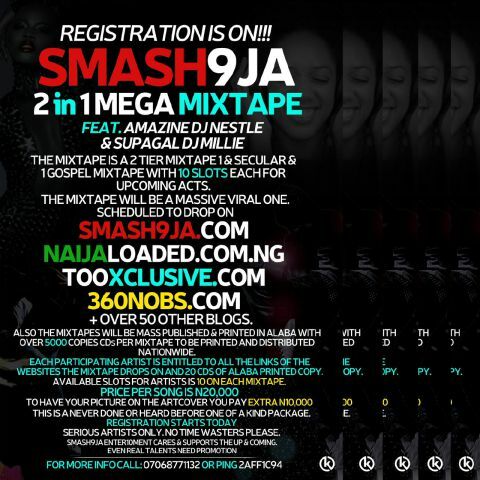 Smash9ja 2 in 1 Mega Mixtape Drops this August . Ft Amazine Dj Nestlé & @SupagalDjMillie @Smash9ja. Bookmark the permalink.